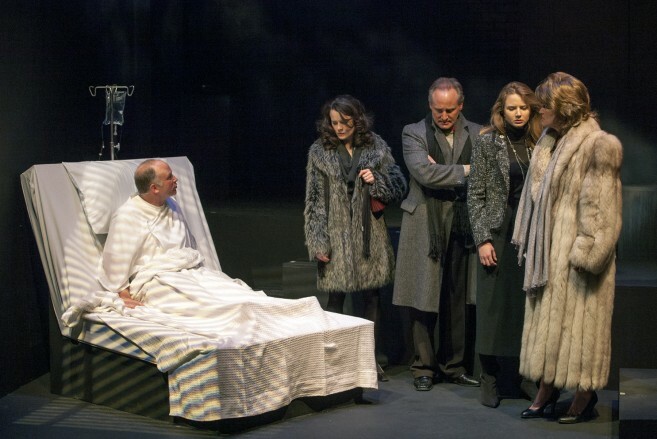 St. Louis Actors’ Studio continues the powerful acting performances that have dominated 2014 thus far on local stages. Arthur Miller’s “The Ride Down Mount Morgan” is one of his later works- written in 1991- but it has a style and wit not usually associated with most of his heavier plays but truly holds up against some of those better dramatic works. With Bobby Miller at the helm directing and some delectable acting performances, it can also hold up against some of the best works STLAS has done. Add to the mix Lyman’s friend, lawyer Tom, given a deft and charming yet totally exasperated performance by Eric Dean White and the hysterical turn by Fannie Lebby as Lyman’s nurse who acts as the casual observer and commentator on the bizarre goings on and you’ve got a delightful comedy of manners- or lack thereof. Director as well as sound designer, Bobby Miller has brought out all of the charm and wit of this outrageous and unusual piece from the master of drama, Arthur Miller. The multi-level set design of Cristie Johnston works extremely well as it involves the hospital bed along with various other locations including the flashbacks in all of their lives. Bess Moynihan’s superb lighting design enhances the proceedings as well and Teresa Doggett’s costumes are perfect showing off the class of the ladies who have led a very good lifestyle with Lyman as their husband. 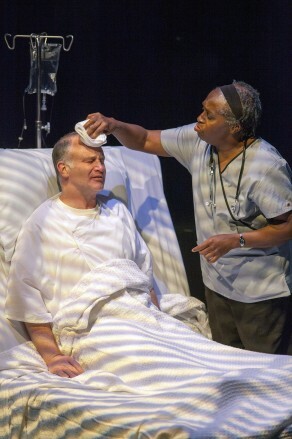 St. Louis Actors’ Studio continues to do great work as exhibited by their 18 nominations from the St. Louis Theatre Circle Awards for last year’s efforts. Arthur Miller’s “The Ride Down Mount Morgan” is just a whole lot of fun. This entry was posted on February 5, 2014 at 9:43 pm02 and is filed under Uncategorized. You can follow any responses to this entry through the RSS 2.0 feed. You can leave a response, or trackback from your own site.